The eighth of ten consecutive lectures in California. The only lecture in Stockton. Courtesy of, and with thanks to, the Reference Department, Stockton-San Joaquin County Public Library, Stockton, CA. The subheading to the article above notes that, in looks, Oscar resembled Laura de Force Gordon. 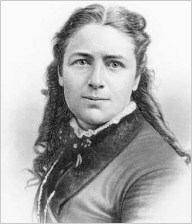 Laura de Force Gordon ( 1838—1907) was an American lawyer, editor, and a prominent campaigner for women’s rights in the American West. She was the first woman to run a daily newspaper in the United States (the Stockton Daily Leader, 1873). She was a key proponent of the Women’s Lawyers Bill allowing women to practice law in California, and the related language in the California Constitution allowing women to practice any profession in California. Charles Dallas, (1814-1883) was born in Scotland, and came to California and Stockton overland in 1849 with his wife and six children. He had a livery stable on Weber Avenue, south side, around the corner from San Joaquin. He sold the stable to George Fox. The year after he came to Stockton, he built a plain one-and-a-half story house on the southeast corner of Main and Sutter. He sold the little red house in 1861 when he moved to Merced County and became a prosperous farmer. In 1870 the old house was torn down and a two story brick building was built on the site. 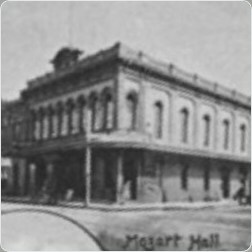 The second story was known as the Mozart Hall, the social center of the city for twenty years. 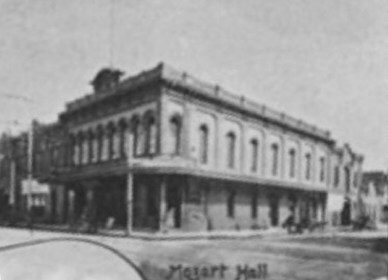 The assembly hall was used for balls, parties, musicales, and all popular social functions. All the high-toned balls and parties were held in the hall. 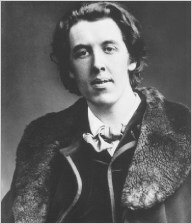 Although no record has been found, it is likely that Wilde stayed over night in Stockton, rather than return to his base in San Francisco. 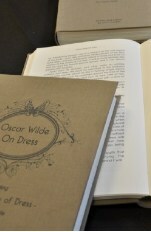 This assumption is based on the difficulties of catching the late night train to Oakland and the ferry boat to San Francisco, plus the fact that Wilde gave an interview in Stockton (see below).